Headbands can be polarizing. They can either make you feel totally chic and put together or conjure up memories from primary school you'd really rather forget. But the return of the headband is fully back in swing thanks to the likes of Bella Hadid, Sarah Hyland and nearly every show at fashion week. Not sure how to wear a headband without looking like a 5-year-old? We're here to help. 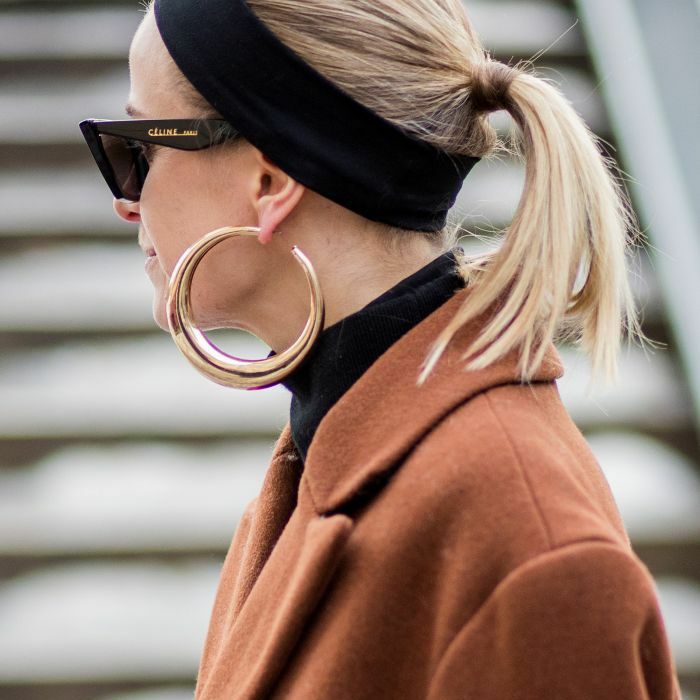 We've rounded up 13 foolproof ways to wear a headband right here. From sporty styles to red carpet–ready ribbons, keep scrolling for all the headband inspiration you'll ever need. This type of headband-parting combo looks great with any hairstyle, length or colour. Part your hair in the middle and push your headband toward the back of your head. Perfect for festivals or an ultra-relaxed vibe, pull your hair back from your face and ditch the parting à la Taylor Hill. For a '90s throwback, copy Sarah Hyland's go-to gym style. Just pair a flat, sporty headband with an easy high ponytail. For a super-simple way to disguise greasy hair, pull the rest of your hair into a low, loose bun. DIY your own headband by tying a silk scarf under the nape of your neck and leave the rest of your hair loose. Follow Bella Hadid's lead and match the colour of your headband to the colour of your shirt. This blush-pink one looks gorgeous matching Bella's soft smoky eyes and pink lips. Flower crowns are out, and festival-style headbands are in. We love this tropical print worn atop braids. Flat headbands don't have to look super sporty. Copy the models at Agnes B by wearing the rest of your hair soft and full of volume for an ultra-glamourous look. For the ultimate Gossip Girl vibes, we love this cute Blair-style bow with loose Serena-esque waves. When one headband just isn't enough, copy Lupita Nyong'o's chic double rope style. If your hair is long enough, you could even create this look by rope twisting your own hair and pinning in place. For a slightly different way to wear the trend, follow Jenna Dewan's style and secure your headband over your middle parting. For shorter or thinner hairstyles, opt for a skinny ribbon headband that won't detract too much from your hair. Yep, the '00s favourite headband is back, and, of course, Bella Hadid makes it look chic. Make sure the rest of your hair is slick to keep the look polished. For more headband inspiration (and to shop the looks), head to Who What Wear.